[STOTS Communications, South Canaan, PA] His Eminence, Archbishop Michael traveled to Kerala, India on February 2 to be the Keynote Speaker and the Guest of Honor at the Centennial of the Diocesan Convention of the Malankara Orthodox Syrian Church in the Diocese of Thumpamon. Presiding over the five-day convention was His Holiness, Baselios Mar Thoma Paulose II, Catholicos of the East and the Supreme Head of the Indian Orthodox Church. He was assisted by numerous Metropolitans of the Holy Synod of the Indian Church. His Holiness is the successor to Saint Thomas the Apostle, who brought the Gospel to India in the mid-first century. The Malankara Orthodox Syrian Church is one of the Oriental Orthodox Churches, which separated from the Eastern Orthodox Church in the mid-fifth century over the doctrine of the two natures of Christ, promulgated at the Fourth Ecumenical Council in Chalcedon (451 A.D.). The Oriental Churches do not accept the dogmatic teaching that Jesus Christ is one Divine Person with two distinct natures, one divine and one human. Even though our Churches are not in sacramental communion, the Orthodox Church in America and the Malankara Orthodox Syrian Church have a special relationship. Many of the Indian Orthodox clergy have been educated either at St. Tikhon’s Seminary or St. Vladimir’s Seminary. And Zechariah Mar Nicholovos, Metropolitan of the Northeast Diocese of the Indian Church, meets frequently with His Beatitude, Metropolitan Tikhon, as the Indian Orthodox Centre is in Muttontown, NY, not at all far from the OCA headquarters in Syosset. The Centennial Convention is an annual gathering of the Catholicos, hierarchs, clergy and faithful from all over a given area of India to renew their Orthodox Faith through divine services, Scripture study, presentations on the teachings of the Church, and Christian fellowship. This theme of this year’s Convention was “Christ in You” – from St. Paul’s Epistle to the Colossians 1:27 – and the gathering drew thousands of people from Kerala, the southwest region of India. The Convention was hosted by His Grace, Kuriakose Mar Clemis, the Metropolitan of the Diocese of Thumpamon. It took place at the spacious complex of St. Stephen’s Cathedral in Makkamkunnu, Pathanamthitta. Following the Sunday morning Hierarchical Liturgy, which was concelebrated by five metropolitans of the Indian Church, with hundreds of clergy and nearly 5,000 faithful in attendance, Archbishop Michael was given the honor of opening the Centennial Convention by lighting the traditional ceremonial candle. Over the course of the Convention, His Eminence offered three presentations on the theme “Christ in You” – a Scriptural analysis, a patristic commentary, and a practical application – the final one addressed to a crowd of almost 12,000 faithful. His Holiness, the metropolitans, the clergy and faithful were very receptive to his reflections, which will be published in Malayalam, the language of the Indian Orthodox Church, in the Commemorative Journal marking the Centennial Convention. An interesting detail of the Convention is that it was held during the time when we observe the Week of the Publican and Pharisee and do not fast. The Indian Church does not have that practice of a fast-free week, and then a week of giving up meat, and then finally giving up dairy. At the same time as we observe the Week of the Publican and Pharisee, they observe a “mini Lent” – a time of strict fasting, penitential services and prostrations, in honor of the prophet Jonah and the fasting and repentance of the Ninevites. During the time of the Convention, no meat, fish or dairy products were eaten. Throughout the rest of his week-long stay, Archbishop Michael traveled to various centers of the Orthodox Church in India. His schedule was set up by Fr. Abraham Thomas, the Secretary of the Department of Ecumenical Relations for the Malankara Orthodox Syrian Church. He was personally assisted by Deacon Kuriakose (Alex) Abraham. Both Fr. Abraham and Dn. Alex are graduates of St. Vladimir’s Seminary. His Eminence was able to visit the headquarters of the Church, the residence and office of the Catholicos, in Kottayam. 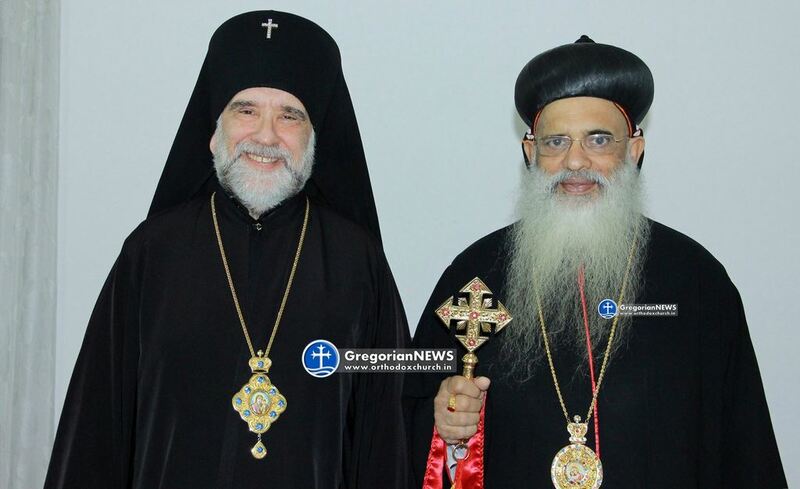 He was the guest of the senior hierarch of the Holy Synod of India, His Grace, Thomas Mar Athanasios, the Metropolitan of Chengannur, at his diocesan residence and headquarters. Archbishop Michael visited two men’s monasteries and one women’s monastery. All three have schools and orphanages attached to them, where not only Orthodox boys or girls are taught and cared for, but Hindus and Muslims as well. One of the highlights of Archbishop Michael’s travels was his veneration of the relics of Saint Thomas, the Apostle to India. Known by most as the “doubter” among the disciples, it was Saint Thomas who made the greatest profession of faith; he was the first to call Christ “God” – “My Lord and My God” (John 20:28). The other highlight of His Eminence’s travels was his visit to the Orthodox Theological Seminary in Kottayam, where he addressed the faculty and students. He spoke on the important need for the spiritual formation and theological education of clergy in today’s world; he encouraged the students to work hard and seek the will of God in their service of Him. After his presentation, he fielded questions from the 140 seminarians in residence. He also had an opportunity to share dinner with the Seminary community and to speak to a number of the students individually. His Eminence is grateful for the kindness and hospitality of the hierarchs, clergy and faithful of the Indian Orthodox Church over the course of his week-long stay in Kerala. He was the recipient of numerous awards and gifts, but most importantly the prayers of countless individuals whom he met.